Please see https://releases.xamarin.com/stable-release-15-2/ for the details about this release, including the steps to update or downgrade as needed. This release is now available in the Xamarin updater channels and as part of the May 10 - version 15.2 update for Visual Studio 2017. Please file a quick bug report using the "15.2 Release" new bug form if you see any suspicious behavior in these versions that you wish to report. EDIT May 15: Add a list of commonly seen issues for the 15.2 release so far as well as information about the switch from mcs to csc. EDIT May 16: Update wording for Bug 56213 to mention alternate symptom involving breakpoints on device. EDIT May 17: Move the details about the list of commonly seen issues onto the release blog for visibility and tidiness. EDIT May 18: Restore the Release Blog links now that the release blog is back up. EDIT May 23: Adjust title for latest release. I have trouble installing the VS for Mac. After I open the installer, it only tell me that I don't have Internet connection. But I do have! I am from China. Error: Compiler crashed with code: 1. I can confirm the compile error neodrey gets. I get it too. Switching to .Net Runtime 4.8.1 and the project compiles fine. There's some confusing stuff going on with these releases. I'm on the stable channel and am prompted to install MDK 5.0.0.100 which sounds like the next big release of Mono. 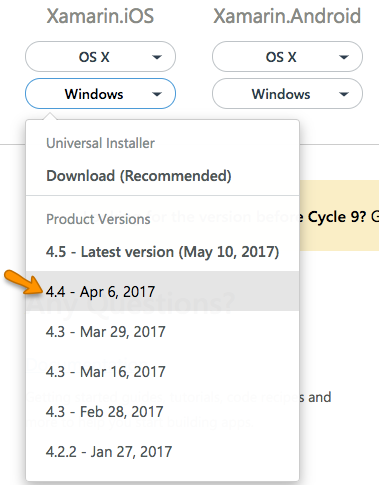 I checked the Mono page as soon as I saw this and the latest release was still 4.8.1.0. That was a couple of days ago and remains the case. I was already hit with a problem when I had VS for Mac installed and it installed an alpha version of the Mono framework against my wishes. I lost half a day sorting things out. I'm not sure this is a stable release at all. So many serious bugs already reported. What a shame! Neither of my projects works as expected. Nearly every major Xamarin update is a pain and regression nightmare! And no previous version is available to downgrade that is compatible with VS 2017. After updating Xamarin Studio to stable-release-15-2 our apps built with Xamarin Forms became very slow, with a horrible performance. It is more visible in the Android version but in the iOS version it also gets worse. We had to downgrade the app in the play store to a build before we updated. It's disappointing such major issues are still appearing in these stable builds. You really need to wait for a couple of service packs before jumping into these new cycle releases. For the past 4 years I have *never* taken a new stable release, I always wait until it's several service packs in and the noise has died down. I'm not trying to rub salt in anyone's wounds, but I just can't afford the time installing and having to rollback to the exact version I was using previously. @BrendanZagaeski Could you guys make the previous version (15.1) available to download for Visual Studio 2017, please? I don't want to downgrade entire Visual Studio just for that. It's way easier to install Xamarin extensions separately. So please make .vsix versions available since judging by your reaction (or absence of it), those blocker bugs are not gonna be addressed anytime soon. I'm stuck with all my projects! Unfortunately, the Visual Studio Servicing rules currently only allow either (a) staying on the RTW version (15.0), or (b) taking the latest update (15.1, 15.2, etc.). If you'd be interested to see a feature added for the Xamarin extensions in particular that would allow mixing a different older version of Xamarin with a newer version of Visual Studio 2017, I would recommend adding a feedback item and voting on it on https://xamarin.uservoice.com/. Thanks! The individual Bugzilla bugs are the best place to watch for updates on the issues since that is where the engineers for each specific product will be able to offer detailed feedback. Thanks! Thank you for the info. I didn't know that. That's sad. That's exactly what I mean (I didn't mean your personal reaction ). Killing silence so far on the majority of issues. I am not sure about the reason of this and if anyone has the same issue but since I updated to visual studio and compiling to Android (Using Xamarin.Android) my application started to have UI Thread blocking issues (specially on page transitions) weird thing because this was not happening with the last version. I should also mention quickly that the download for Visual Studio 2017 RTW version 15.0 is available on My.VisualStudio.com using either an MSDN subscription or a Dev Essentials account, and the matching older Mac packages for Xamarin are listed on the release blog post. The latest "stable" release 4.5.0.443 has effectively crippled me. Totally unable to compile without 'Build error: "Unable to copy file ... " / "Could not copy ..."' error every time. @JulianRadowsky Can you tell me how you reverted to release 4.4.0.34 ? I have exactly the same problem and I really need to complete an app rather quickly. There are links on this page for the previous release versions and instructions- under the section "Previous Versions for Visual Studio 2015 or Mac-only". I'm just starting the process of reverting, so can speak as to how "easy" it is. None of the Windows options have Visual Studio in their dropdowns. The labels in the drop-downs show only the version numbers. The Xamarin.VisualStudio 4.4.0.34 .msi file is linked to the to 4.4 - Apr 6, 2017 item under the Windows drop-downs for either Xamarin.iOS or Xamarin.Android (it's the same link for both drop-down menus). Note that the Xamarin.VisualStudio .msi is only applicable for Visual Studio 2015 and lower. For Visual Studio 2017, the steps are a bit different as mentioned on the release blog post. For the past 4 years I have never taken a new stable release, I always wait until it's several service packs in and the noise has died down. I'm not trying to rub salt in anyone's wounds, but I just can't afford the time installing and having to rollback to the exact version I was using previously. @FredyWenger and that sir, is exactly the problem with Xamarin's releases. And this isn't a new problem, I adopted this strategy to protect my development environment over 4 years ago. Im glad I still follow this strategy. @BrendanZagaeski - after downgrading to 4.4.0.34 on Visual Studio 2015, how can I downgrade the Visual Studio for Mac that I replaced the Xamarin Studio with to sync and operate with 4.4.0.34 on Windows ? If you also sometimes do development work directly on the Mac or use Xamarin.Mac, you can also install the older versions of Xamarin.Android, Xamarin.Mac, Xamarin Studio, and the Profiler as needed. Note that depending on how you updated, you might still have Xamarin Studio installed in your Applications folder alongside Visual Studio for Mac. Those 2 application bundles don't directly conflict with each other, but Visual Studio for Mac won't be able to start up when using Mono 4.8. @BrendanZagaeski thank you for a very quick response. I will be downloading and downgrading these packages on the Mac allowing me just to use the Xamarin Studio as the IDE. That is fine. I will use the Visual Studio for Mac somewhere along the line. @BrendanZagaeski is there a 15.1 installer? this linker issue has crippled my builds. This is unacceptable that this was released. is there a 15.1 installer? The download for Visual Studio 2017 RTW version 15.0 is available on My.VisualStudio.com using either an MSDN subscription or a Dev Essentials account, and the matching older Mac packages for Xamarin are listed on the release blog post. what about Xamarin Studio 15.1? That shouldn't be too tricky in theory. As mentioned a couple comments ago, you can just install the old packages "over" the new versions to downgrade. (It isn't necessary to delete the newer version beforehand.) Be sure to grab all of the appropriate "Mac-only" versions from https://releases.xamarin.com/stable-release-15-2/ based on what you have installed. For Bug 56296 "MTOUCH: error MT2001: Could not link assemblies." in particular, you can also check that Project > Active Runtime shows Mono 4.8.1 as the active runtime in Xamarin Studio since the issue is related to the new portable .pdb debugging symbols format that is generated by default in Mono 5.0 (see also the bottom of the first post in the thread for some additional background info about that). Also, is this option available for iOS projects or is it limited to tvOS/watchOS ?